You will almost always come across light brown to dark brown surface discoloration when inspecting apricots. The apricot’s skin is very tender and easily susceptible to discoloration resulting from what is commonly referred to as “roller damage.” Roller damage was the common culprit, as the fruit would be roughed up along the packing the lines, on the roller belts. The truth is, any type of abrasion, from picking the fruit, to unloading the fruit from the bins, to packing the fruit, or even the apricots rubbing up against each other may cause this type of discoloration. The above image is very typical of the discoloration you may encounter. At first glance you would either discard the fruit if you were packing it, or you would score the fruit as being damaged by discoloration if you were inspecting the fruit. But checking the USDA Inspection Instructions, you would be allowed an area of of up to 10% of the surface with brown discoloration, being scoring the apricot as damage by brown surface discoloration. 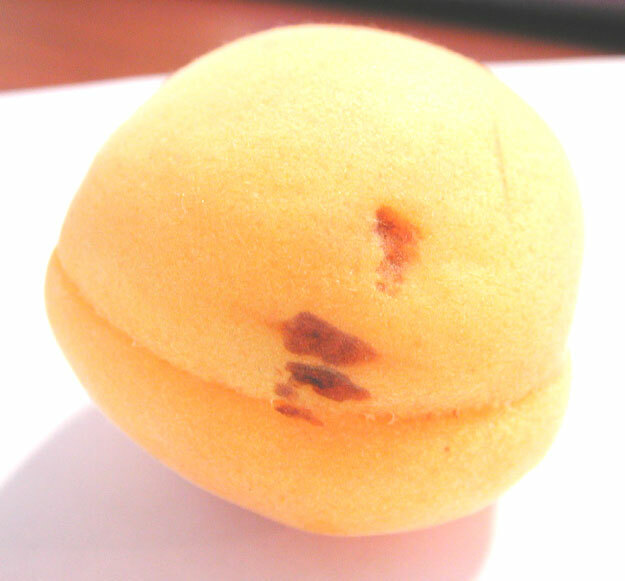 You can actually see only half of the apricot, or 50% of the surface. Half of that area is 25%, and another half is 12-1/2%. I added a blue circle to show you what 10% of the area would represent. 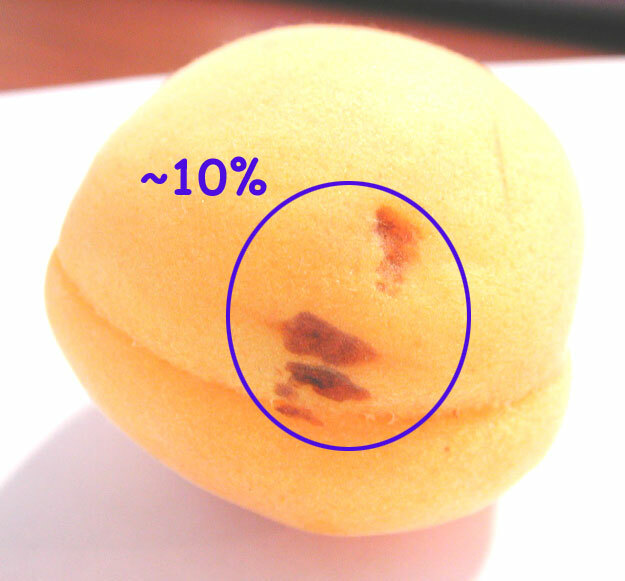 As you can see, the discolored spots do not come close to the 10% surface area allowed by the USDA. A couple of things not mentioned in the USDA Instructions; if the discolored area(s) are sunken, or if the discoloration is darker than brown. You would allow for a less area if the areas are sunken, as shown above, and a less area of the discoloration if it is darker than brown in color. Taking these factors into account, the above apricot would be scored as damage by brown to dark brown surface discoloration.